Energy Routine - how to raise your energy and increase focus! This is how to boost your natural energies and reset your electro-magnetic body. The 27th and last points on the kidney meridians are the neurological centre of the acupuncture circuit. This main switchboard is an important organiser of energy flow throughout the body. 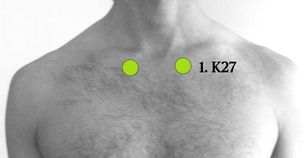 Energy travels in a figure-8 pattern throughout the body and the K27 points are the main junctions where ALL meridians (energy pathways) meet! So whatever physical or emotional challenge you may have, start with K27! The thymus gland comes from the Greek which means 'vital energy'. All of our emotional impulses come here and its connected to our emotional language, emotions, heat, colour. It also sitting on the heart chakra. 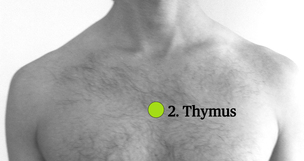 The thymus gland is responsible mainly for the immune system which defends us from viruses and bacteria. It programs and regulates our defence system. The thymus gland's function is greatly reduced if we have a shock whether it may be a huge one or a mild one such as stress. So we can re-set this by massaging, tapping or thumping the gland. It can be said to be spiritual first aid! Do it any time that you are stressed and notice what it does to your body and your mental states. If these points are really sore, stimulate them by rubbing and the soreness should disappear in a few days. These points can be stimulates while taking three deep breaths, and even longer --- for two or three minutes at a time. 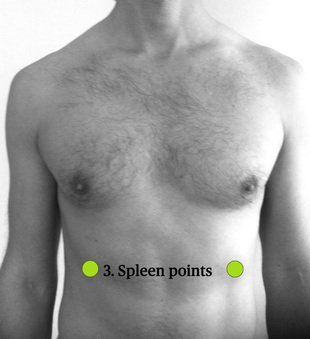 After food, if you're feeling a bit full or have indigestion, or if like me you're always seeking ways to loose weight - go thump the spleen points!!! Ideally do the cross crawl after the 3 steps above for best results. I learnt it in Touch For Health Kinesiology which I HIGHLY RECOMMEND as a fabulous introduction to energy balancing techniques that help with everything. All of these techniques are covered and you will understand and be able to use them on friends, family and colleagues as I do with great success! See it all on video!